Todd spent eight years as Construction Manager for Chicago’s biggest firm, teaching himself filmmaking on the side and eventually making the leap to full-time filmmaking in 2008. Todd’s second narrative feature, “LEFTY,” screened at festivals across the country and was named in “The Top 10 Movies of 2009…” by the Chicago Tribune’s Metromix. His follow-up, “Son of None”—a narrative short shot in Liberia—won the Special Jury Award at Slamdance 2011 and won Best Short at the Boston Film Festival. Todd’s latest narrative feature, “Be Good,” stars indie-favorites Amy Seimetz and Joe Swanberg and was called, “Well acted, crafted and observed” by Variety. During his spare time, Todd is adapting the book “A Saint on Death Row” by New York Times best-selling author Thomas Cahill. Prior to working at BendFilm, Todd was the Executive Director of a successful non-profit that runs a boarding school in Liberia. Avid hikers and all-around outdoors lovers, Todd, his Northwest-native wife, Monica, and their two young children are thrilled to be living in Bend. Erik Jambor co-founded the Sidewalk Moving Picture Festival in Birmingham, Alabama in 1999, serving as Director for its first eight years and growing the event into a filmmaker favorite and one of Time magazine’s “Film Festivals For the Rest of Us.” While at Sidewalk he developed and produced year-round programming, including the organization’s inaugural Birmingham SHOUT, the first LGBTQ film festival in Alabama. Erik ran the 2007 BendFilm Festival in Bend, Oregon, and from 2008 – 2014 served as Executive Director of Indie Memphis. During his seven years at the helm, Indie Memphis earned recognition in five of MovieMaker magazine’s annual film festival rankings, most recently in 2014 when it was named as both one of the “25 Coolest Film Festivals in the World” and “50 Film Festivals Worth the Entry Fee.” Erik was presented with Indie Memphis’ inaugural Vision Award in 2015 for his permanent impact on the festival’s legacy. He has served on numerous festival juries, including Slamdance, and SXSW. Abby has been a supporter, volunteer and festival attendee since BendFilm began. Now she joins the festival behind the scenes as the year-round operations manager. Abby and her husband, Bill have called Bend home since 2002 when they moved from the east coast. Before staying home to raise her two daughters, Abby worked as a paralegal, managing both the small office and legal practice. Abby and her family can often be found out and about enjoying everything that Central Oregon has to offer. After 18 years co-leading tbd, a branding agency, René launched her own boutique creative studio, René Mitchell Creative, combining her experience and passion around creative, cultural and civic change. René brings a unique perspective to the work, informed by decades of creative exploration both professionally and personally, and believes that art has always been one of the greatest tools for challenging perception and creating conversation. René is an arts and culture advocate serving on the Caldera Arts Board, Art in Public Places Board, ScaleHouse Board, and is the visionary of the Bend Design Conference. Though, she gets most of her inspiration from her two young daughters and their creative pursuits. 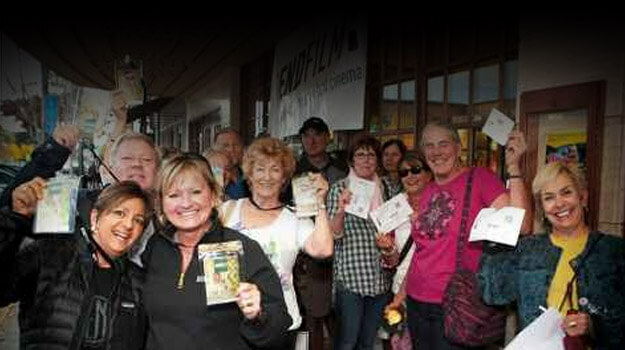 Ellen moved to Bend in 2014 after 30 years of involvement with The Telluride Film Festival and Mountainfilm in Telluride. She created outreach programs for both festivals in Colorado, and is looking forward to designing a unique film series for a year-round Bend audience and to helping produce special film events outside of our October festival. Giancarlo Gatto joined the BendFilm board in January 2015 after volunteering as a venue manager for the 2014 festival. He has worked in the mortgage industry for almost 15 years in a multitude of positions. He currently consults for Philadelphia based Beneficial Bank as a Secondary Market Analyst. He studied Mass Media Communications at LaSalle University in Philadelphia where he built on his already existing passion for film, art, music, and technology. He moved to Bend from the Philadelphia area in 2011 with his wife and three children. Giancarlo is grateful to be able to bring his financial mind and artistic heart to BendFilm as a board member. Kirsten Hostetler found her way to BendFilm four years ago as a volunteer, having first found her way to Oregon a month prior. Ending up in Bend after a convoluted journey from Illinois via Indiana and Maryland, Kirsten is glad to have located a place where skiing is the norm, views are mountainous and humidity is negligible. Kirsten has an almost embarrassing knowledge of movie trivia and began volunteering with the festival immediately after discovering her newly-appointed hometown had such an prodigious and unique commitment to independent art. Kirsten received her MLIS from the University of Washington in December 2013 and is easily identified as a faculty librarian at Central Oregon Community College by her bun, glasses and cardigan. Originally from Indiana, Bob migrated to Corvallis, Oregon in the early 90s. After a few years and gigs as a fisheries biologist and a commercial fisherman in the Bering Sea he settled down a bit. In 2000 he, his wife Suzy and daughter Alexandra packed up the truck and came to the dry side of the hill to settle in Bend. The love of independent thought and expression led to an interest in BendFilm where he was initially involved primarily as a festival sponsor. That led into more duties and Bob is a recycled board member, serving his first stint during the formative years of BendFilm. With the organization comfortably in good hands he took a break for a few years from formal involvement and was only recently recalled to active duty. 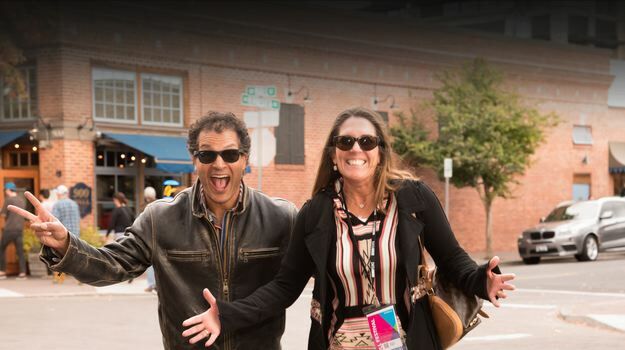 Denise found her way to BendFilm in 2014 when she reconnected with one of her former co-workers from San Diego and decided to move to Bend. Together they run Schliebe’s L.I.F.T., Legendary Indoor Fitness Training. Denise began her stint with BendFilm as the Housing and Logistics Coordinator in 2014 and joined the Board shortly thereafter. Having lived in Salt Lake City for 10 years, Denise began volunteering for the Sundance Film Festival in Park City as a way to “give something back.” She has traveled to London to volunteer for the Sundance Film Festival and has been a regular with Sundance for 12 Festivals. She has also volunteered for the La Costa Film Festival, and was Festival Producer for the San Diego Film Festival in 2013. You might say that Independent Film is a passion of hers, and her experience tremendous. In addition, she has worked for multiple non-profit businesses, which allows her to understand the myriad of needs connected with BendFilm. Laurie Halter first came by her love of movies as a working screenwriter in Hollywood collaborating with producers the likes of Beau Flynn and Brooklyn Weaver, and was represented by Metropolitan Talent Agency. After the birth of her son, Ethan, Laurie decided to focus her resources on her PR firm, Charisma! Communications, and her growing family. She chose the beauty of Oregon over the excitement of Los Angeles and has never looked back. Laurie, her husband Tim, and her two children, moved to Bend in 2011 and fell in love with the outdoors and laid-back lifestyle. She’s excited to again return to her passion for movies working with BendFilm, and giving back to the community she loves. Dad, husband, professional photographer, amateur actor and filmmaker, and general do-er of outdoorsy things moved with his family to Bend in 2015, and he has volunteered for BendFilm since his arrival. Due to his addiction to movies and his love of Bend, he comes onto the BendFilm board with a desire to do whatever he can to see the festival continue to shine. If you want to know more about why he thinks BendFilm is so important to the economy and culture of Central Oregon, just ask him! But be careful, he may never stop talking! Natalie Dent – Bio coming soon!